As a representative product of hardware tools, the claw hammer is mainly used for picking up nails. It seems to be a tool that is easy to operate, but if we use it improperly, it will cause harm to us. What should we do to properly use it? 1. The hammer head and handle of the claw hammer must be firmly connected, the hammer head and the handle are loose, the handle has split and crack must not be used. The hammer head and the hammer handle should be wedged in the mounting hole. It is better to use the metal wedge. The length of the wedge should not be more than 2/3 of the depth of the mounting hole. 2. When choosing a hammer, the length of the handle of the hammer must be moderate so that it can be held comfortably. 3. The use of a claw hammer, if it is necessary to use a smaller force, then we can use the hand swing, but if you need to use a stronger force, it is appropriate to use the arm swing, only in this way, in order to make it get better use. 4. The hammer head of the claw hammer can not be quenched, there can be no cracks and burr, found frill burr should be dressed in time. 5. The hammer head should be flat nail hammer cap, so that the nail vertical into the wood, when pulling out the nail, it is appropriate to pad the wooden block in the horn, to enhance the pulling force, should not put the claw hammer as a pry tool, should pay attention to the hammer hit the surface smooth and intact, in case the nail fly or hammer slip hurt people. 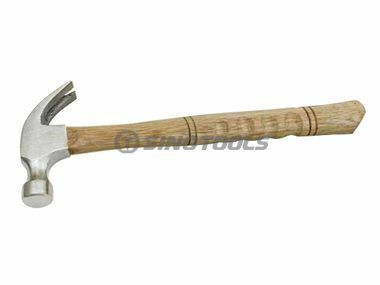 The claw hammer is originally used by using the principle of leverage, so we should pay attention to the above methods when carrying out this aspect, and every detail is more important, so we can refer to the above content in later use. The above is about the correct use of the content of the claw hammer is a simple introduction by the China Hammer Manufacturer, if you want to know more about the relevant content, welcome to call our company for information, we look forward to your call.